Indasa Rhynalox 9" x 11" Dry Sanding Sheets, P36D Grit, Pack of 50. 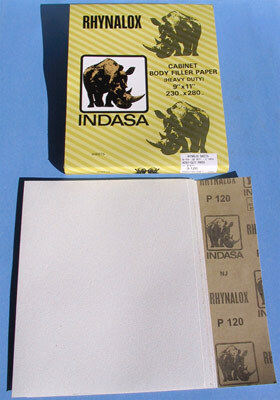 Indasa Rhynalox 9" x 11" Dry Sanding Sheets, P40D Grit, Pack of 50. Indasa Rhynalox 9" x 11" Dry Sanding Sheets, P60D Grit, Pack of 50. Indasa Rhynalox 9" x 11" Dry Sanding Sheets, P80D Grit, Pack of 50. Indasa Rhynalox Plus 9" x 11" Dry Sanding Sheets, P100C Grit, Pack of 50. Indasa Rhynalox Plus 9" x 11" Dry Sanding Sheets, P120C Grit, Pack of 50. Indasa Rhynalox Plus 9" x 11" Dry Sanding Sheets, P150B Grit, Pack of 50. Indasa Rhynalox Plus 9" x 11" Dry Sanding Sheets, P180B Grit, Pack of 50. Indasa Rhynalox Plus 9" x 11" Dry Sanding Sheets, P220B Grit, Pack of 50. Indasa Rhynalox Plus 9" x 11" Dry Sanding Sheets, P240B Grit, Pack of 50. Indasa Rhynalox Plus 9" x 11" Dry Sanding Sheets, P320B Grit, Pack of 50. Indasa Rhynalox Plus 9" x 11" Dry Sanding Sheets, P400B Grit, Pack of 50.